In part two of a fact-filled feature Scrum.com brings you all you need to know about yet more world competitions. Get ready to sort your Bledisloe Cup from your Mandela Plate with part two of our trophy special. The Tri-Nations is the premier southern hemisphere competition. It is contested annually by Australia, New Zealand and South Africa. The launch of the Tri-Nations in 1996 was the culmination of a long standing desire to create an equivalent to the northern hemisphere's Five Nations championship. Previously there had been sporadic Tests to contest the Bledisloe Cup between Australia and New Zealand and prior to the international boycott tours by South Africa. As the 1995 World Cup drew to a close, the unions of South Africa, New Zealand and Australia finalised a multi-million dollar deal to form SANZAR, making the Tri-Nations a reality. Each team plays each other three times, expanded from two in 2006, with four points for a win and two for a draw. Unlike the Six Nations, bonus points are awarded for scoring four tries or more or losing by less than seven points. The first tournament was won in a clean sweep by the All Blacks, who repeated the feat the following season. South Africa won their first Tri-Nations in 1998, and Australia claimed their debut win in 2000. Australia defended their title in 2001, but the tournament continued to be dominated by New Zealand into the new century. To date they have captured the title nine times while Australia and South Africa have won two apiece. There have been persistent rumours that Argentina will be added to the Tri-Nations and reports suggest this could happen as soon as 2010 with the re-negotiation of television rights. The emergence of the Pumas at Rugby World Cup 2007, where they finished in third place, makes them the only world power to not play in a regular tournament. The Bledisloe Cup is contested annually by New Zealand and Australia. The impressive piece of silverware is at stake when the two southern hemisphere giants meet during the Tri-Nations but is not up for grabs if the sides meet during the Rugby World Cup. Traditionally the cup is contested over three Test matches, although this number dropped to two during the Tri-Nations period of 1999-2005. The Bledisloe Cup was donated by Lord Bledisloe, Governor of New Zealand, in 1931 and was to be contested annually by the two countries. It is the largest trophy in world rugby, standing at a metre tall on its base, and was crafted from silver by Walker and Hall of London. Up until the advent of the Tri-Nations in 1996 the Bledisloe Cup was contested in dedicated test matches, a trend that was resurrected late in 2008 when New Zealand and Australia played in a one-off fourth Bledisloe Cup match in Hong Kong. The All Blacks took the spoils in Hong Kong with a 19-14 win, while rumours were rife that there would be future Bledisloe contests staged abroad in the future, possibly in Denver, USA or Tokyo in coming seasons. To date New Zealand have dominated the series, claiming the title on 37 occasions as opposed to Australia who have lifted the trophy 12 times. 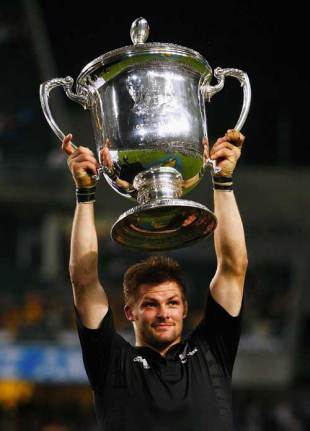 The All Blacks have currently been in possession of the Cup since 2003, and retained it 3-1 in 2008. 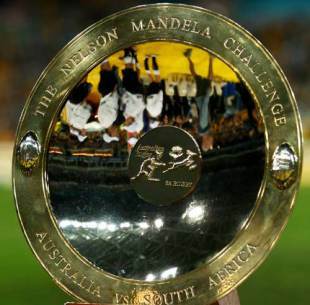 The Mandela Challenge Plate is contested by South Africa and Australia during the annual Tri-Nations competition. It continues the link between South Africa's first post apartheid president and rugby union following the iconic presentation ceremony at the 1995 Rugby World Cup final. The plate was first played for in 2000 in a one-off test match, which Australia won 44-23 in Melbourne. In 2001 the plate was decided in the Ellis Park Tri-Nations Test, won by South Africa. In 2005 South Africa retained the Plate over two legs and in 2006 the Tri-Nations was expanded, meaning that the plate would be contested over three Tests, much in the same way as the Bledisloe Cup. The trophy itself is a leather clad silver plate complete with a 24 carat gold rim. The centre of the plate is a gold disc emblazoned with both a Springbok and a Wallaby. 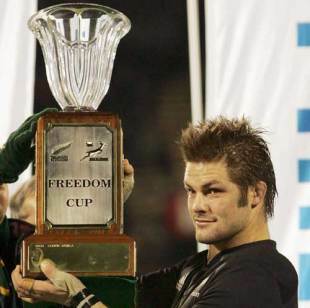 The Freedom Cup is a competition between New Zealand and South Africa during the Tri-Nations. It was first introduced in 2004 to commemorate 10 years of democracy in South Africa. In the first one-off meeting for the cup, South Africa ran out 40-26 winners at Ellis Park. 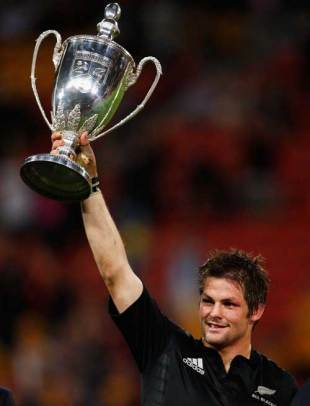 In 2006 the Cup was contested over all three Tri-Nations fixtures, now the norm, with New Zealand winning the series. 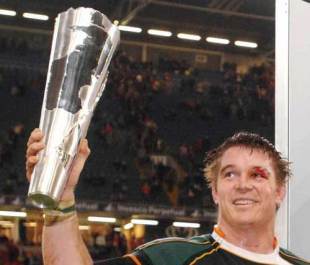 Former Springbok captain Joost van der Westhuizen mistakenly presented the trophy to John Smit after South Africa had won the dead rubber third test. New Zealand have won the cup three times with South Africa's only success coming in the inaugural year. New Zealand's most recent victory came in the 2008 Tri Nations, where they won the three match series 2-1 after victories in Wellington and Cape Town. The Cook Cup is played for on a home and away basis by England and Australia, and was first contested in 1997. Named after James Cook, the famous English explorer who discovered Australia, the Cup is made from Crystal and was crafted by Royal Doulton in London. In 1997 Australia drew first blood, winning 25-6 at Aussie Stadium. The return match at Twickenham was drawn 15-15, meaning that Australia had secured the first Cook Cup. Australia retained the cup in 1998, following a 76-0 hammering of England in Brisbane during the infamous English "tour of hell". 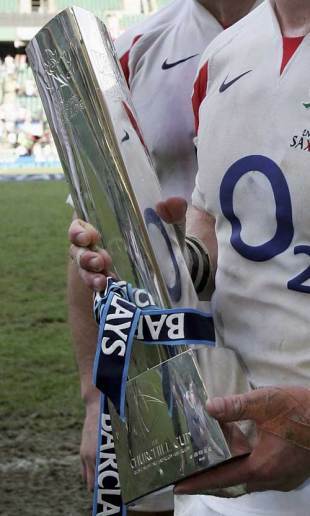 Between 1999 and 2004 the Cup was contested on a single test basis, with England claiming their first Cook Cup in 2000 after beating Australia 22-19 at Twickenham. The cup was last contested in 2006, when Australia won 34-3 and 43-18 to regain the Cup. The Prince William Cup was launched in 2007 by the Welsh Rugby Union in order to commemorate 100 years of competition between Wales and South Africa. 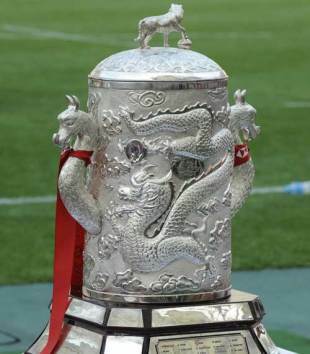 The cup was manufactured by jewellers from Llanelli and Neath and is 55cm high and is of a 1.5mm gauge. The ornate design of the cup is said to represent the landscapes of Wales and South Africa. There was a certain amount of controversy surrounding the WRU's naming of the cup, with fans and officials disappointed that the cup would not be named in memory of Welsh great Ray Gravell, who passed away on October 31, 2007. The subject became a political issue with many believing that the cup should be named after a patriotic Welshman rather than the heir to the throne. The Dave Gallaher trophy is contested every time New Zealand meet France. 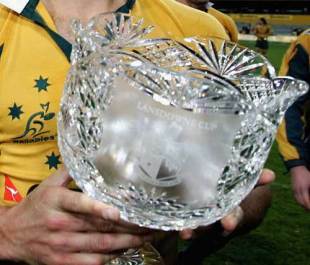 The trophy was first introduced in 2000 as a celebration of the rivalry between the two nations. It is named after the legendary captain of the 1905 All Black "originals" Dave Gallaher, who was tragically killed in Belgium during World War 1. The trophy is contested on a challenge basis, with the holders having to defend their trophy. There can only be one challenge match per Test series, for example in 2000 when the Test series between the sides was drawn 1-1 but the All Blacks won the challenge Test and therefore the trophy. France are yet to win the trophy, with the All Blacks having won and retained on seven occasions. The Lansdowne Cup is played for by Ireland and Australia. The competition was inaugurated in 1999 when the Sydney-based Lansdowne Club donated the trophy to the Australian Rugby Union. The Cup (and the club that donated it) is named after Ireland's most famous rugby stadium, Lansdowne Road in Dublin, and was crafted by Irish firm Waterford Crystal. Australia won the first Lansdowne Cup in a two test series in 1999, when they defeated Ireland 46-10 and 32-26 in Brisbane and Perth. Ireland won their first Cup in 2002, winning 18-9 at Lansdowne Road. 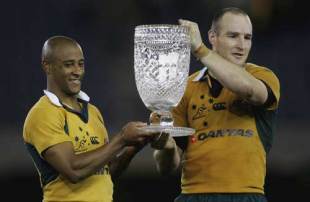 Australia currently hold the Cup following their 18-12 victory in Melbourne in 2008. 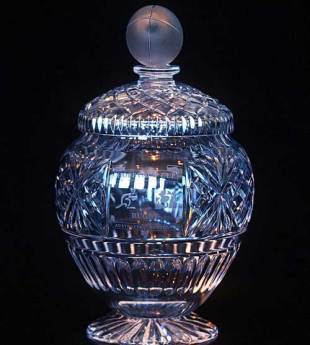 The Hopetoun Cup was introduced in 1998 to be contested in perpetuity by Scotland and Australia. The Cup was named after the Seventh Earl of Hopetoun, a Scotsman, who was Governor-General of Australia at the turn of the century. Australia won the inaugural series in 1998, beating Scotland 45-3 and 33-3 in Sydney and Brisbane respectively. Scotland have yet to win the Cup, last losing out 44-15 at Murrayfield in 2006. This trophy was introduced by the French Rugby Federation in order to celebrate the bi-centenaries of Australia and France in 1988 and 1989 respectively. The trophy dates from 1988, but was first contested in 1989. The trophy itself is a bronze sculpture depicting two players in a tackle. In 2007 the Welsh Rugby Union and Australian Rugby Union announced plans for a trophy to commemorate 100 years of competition between the countries. It was first contested during Wales' tour of Australia in 2007, with Australia winning both Tests and the trophy. The trophy is named after James Bevan, the Australian born man who captained Wales in their first international against England in 1881. Bevan's parents had emigrated to Australia in 1848, but were killed in a shipwreck in the Bay of Biscay in 1866. Bevan was brought back to Wales by his uncle and settled in Grosmont, Monmouthshire. He captained the disastrous first outing for the Wales team, which by modern scoring methods they lost 82-0. Along with two thirds of the team, Bevan never played for Wales again. The Puma Trophy was first introduced in 2000 and is contested by Argentina and Australia. 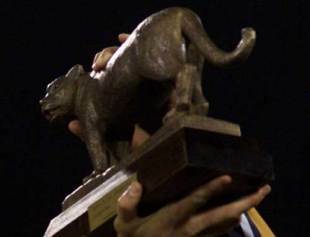 The sides first played each other in 1979, and the trophy is a solid bronze Puma. In the inaugural contest the trophy was contested over two tests, with Australia winning 53-6 and 32-25 in 2000. The only other time the trophy has been contested was in Australia's 17-6 win over Argentina at Lansdowne Road in 2002. The South American Rugby Championship is a two tiered annual tournament for South American teams. The first tournament was hosted in Uruguay in 1951. Argentina has won every championship up to 2008 aside from in 1981 when they did not enter. In 2004 a second tier competition was introduced featuring developing South American sides. Brazil have won this tournament four times, with Paraguay winning it once. In 2008 the second tier tournament also served as World Cup qualifiers, with Brazil winning all four of their games. The Pacific Nations Cup is the tournament encompassing the sides based around the pacific rim: Japan, Tonga, Samoa and Fiji as well as New Zealand Maori and Australia A. The competition began in 2006 as the Pacific 5 Nations, with Australia declining to send a side and the Junior All Blacks instead of the Maori. 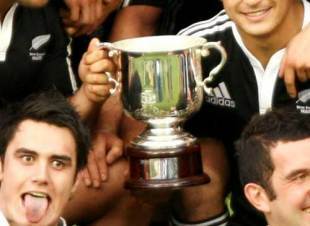 The inaugural tournament was won by the Junior All Blacks and soon afterwards Australia A were added to the tournament. The IRB's aim for the tournament is to improve the regularity of top flight competition for the Pacific sides, whilst offering a good breeding ground for young All Black and Wallaby talent. The 2008 tournament was won narrowly by the New Zealand Maori. The Churchill Cup was introduced in 2003 and is contested annually by England Saxons, USA, Canada and two to three invitational sides. The Cup was named after former English Prime Minister Winston Churchill due to his strong ties with both the US and Canada. Alongside the three permanent sides, the New Zealand Maori, Argentina A, Scotland A and Ireland A have all taken part in the competition. England Saxons have won the tournament on three occasions and the New Zealand Maori twice. Until 2003 the Churchill Cup also featured a women's tournament featuring the same teams as the men's. The Africa Cup is organised by the Confederation of African Rugby (CAR) and is contested every year by 12 nations. The most recent champions are Uganda, who beat Madagascar 42-11 in the 2007 final. South Africa's Amateurs hold the record for wins, with three tournament triumphs to their name. The CAR Super 16 was founded in 2004 and is contested by the second tier African nations, below those in the Africa Cup. The competition is divided between North and South, with two pools of four in each section. The winners of these two pools face each other in the final. The 2007 winners were Nigeria (N) and Botswana (S). The Pan Americano is the premier rugby competition held in the Americas. It has been held irregularly since 1995. The event is co-ordinated by the Pan American Rugby Association and was last staged in 2003, featuring the Rugby World Cup teams of Argentina, USA, Canada and Uruguay where the Pumas claimed the title. The Asian Five Nations is the flagship IRB Asian Competition. It was introduced in 2008 and will be contested annually by Japan, Korea, Hong Kong, Kazakhstan and the Arabian Gulf. In the inaugural tournament staged in 2008 Japan ran out comfortable winners with four bonus-point wins, and were followed by Korea in second. The tournament forms part of IRB plans to expand and further the game in Asia by fostering high-level competition in the region. During the 2007 Iveco Series in New Zealand, the truck manufacturer offered these two trophies. The Trakker Cup was contested by New Zealand and Canada, with the All Blacks beating spirited Canadian side 64-13 in Wellington. The Stralis Cup was contested over two test matches between the All Blacks and France, with the All Blacks winning 42-11 in the first match and 61-10 in the second.